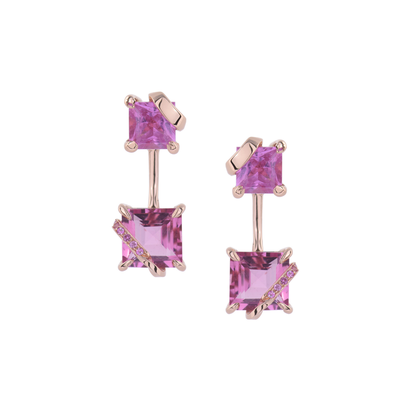 Princess-cut pink sapphire studs: 4mm each with a total of app 1 carat for the pair. Pink tourmalines: 7mm square cut, total drop length: 17mm. Tiny pink sapphires trace the curves of the ribbons wrapping around the tourmalines. The pendants can be adjusted to hang at 2 different lengths to accommodate different ear lobe sizes. The pink tourmaline pendants can be detached and the sapphire studs worn on their own to suit different occasions (swipe to see the different looks).